Do you have a 6 month old? Here’s a sample 6 month routine or rhythm you can adopt for your own family. Congratulations, you’ve survived the newborn phase! This is truly one of my favorite ages. They are still babies, but smiling all the time. Learning to sit up and move and getting their own personality. Anyway, here’s the 6-month routine I used for all of my babies. Note: These are the times I aimed for. If they didn’t happen because baby was hungry, then I adapted and tried to get back to this when able. 6:45 pm – bedtime routine (bath, singing, cuddling, putting on lotion, etc.) We use this for the kitchen sink and absolutely love it. If you’d like to get this sample printable to your inbox, you can sign up below and use it freely! Some thoughts on this 6-9 month age. Research overwhelmingly supports a good routine for young ones. 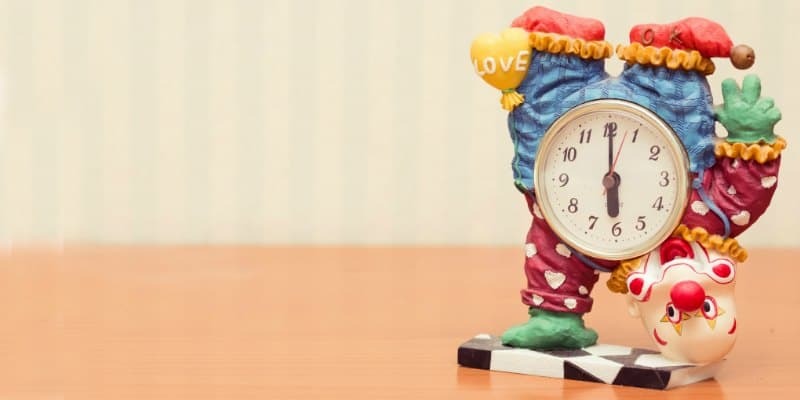 A routine does not, however, necessarily mean you follow the clock per se. If you prefer to have a rhythm where you do one thing after the other, but not necessarily watch the times and that’s fine. Whichever works best. 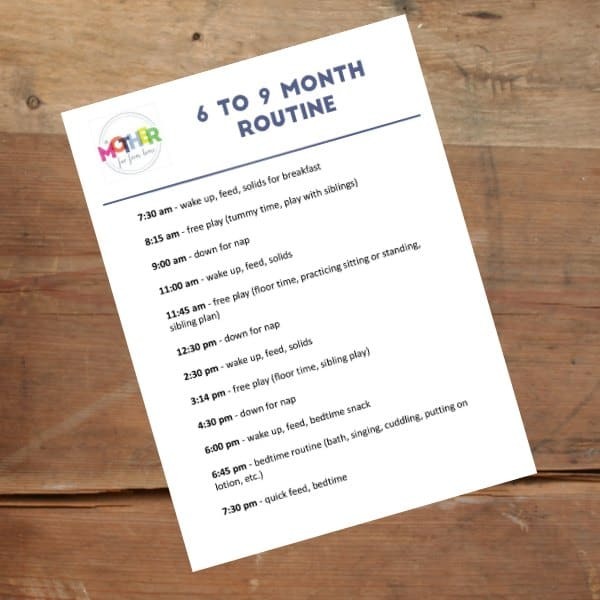 At any rate, using a routine will be a sanity saver for both you and your baby. Here are some sample routines with different times that also have baby/toddler combinations. Whether you waited until the 6 month mark to introduce solids, or started in the 5th month gradually, solids are very important. At 6 months of age if your baby has trouble napping… they are likely hungry. If your baby starts waking up frequently at night, check the amount of solids. Right now your baby likely takes 3 naps a day, the third perhaps being the shortest. The goal is to shorten the third nap so the first two naps of the day remain until around 15-18 months. If you notice your baby naps shorter during the first or second nap, but longer on the third, you can wake the baby early in the third nap. Too long of an evening nap may mean getting to sleep at bedtime is harder, so best to shorten the nap that will drop soon. While an infant seat is a minimalist must have, in my opinion, I like to give my babies any and every opportunity to be on the floor. They’ll roll, sit up, commando crawl, and start spinning in circles. 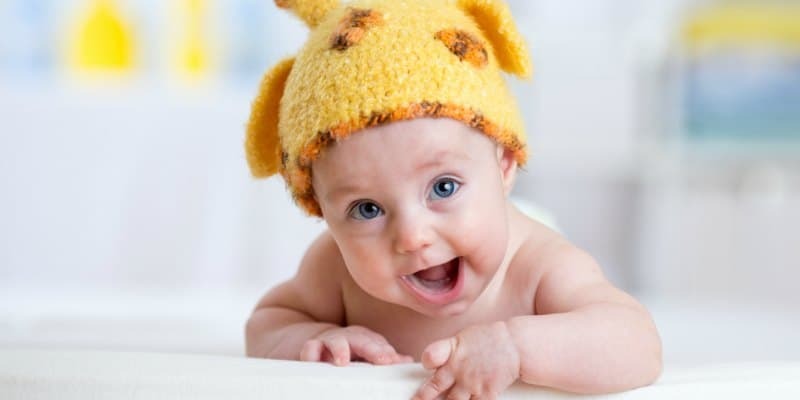 I waver between giving the baby a bath in the morning or in the evening. Some days it’s the morning, some days it’s the evening. I try to just fit it in when I can or when it’s most convenient. A growth spurt often happens at this age so make sure the baby is getting enough milk. I’ll often feed, give solids, let the baby play, feed again briefly before putting him in the crib (awake but drowsy). This helps make sure they’re getting enough to eat during the day. This may be so simple it goes without saying… but the key to a good routine is keeping the routine. It can be tricky to remember everything in order when you’re beginning, but once you get the hang of it, routine will be second nature. It can seem very difficult to get started doing or keeping a routine when you do not have one at all. Here are some ways you can learn to keep your routine. 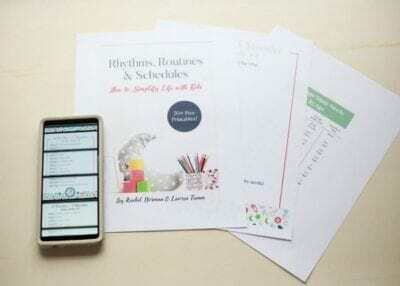 In my Rhythms, Routines, and Schedules ebook I have 25+ sample routine printables from babies age 6 weeks to 5 years. You can take these printables and hang them in your nursery, on the fridge, or keep them in your planner. 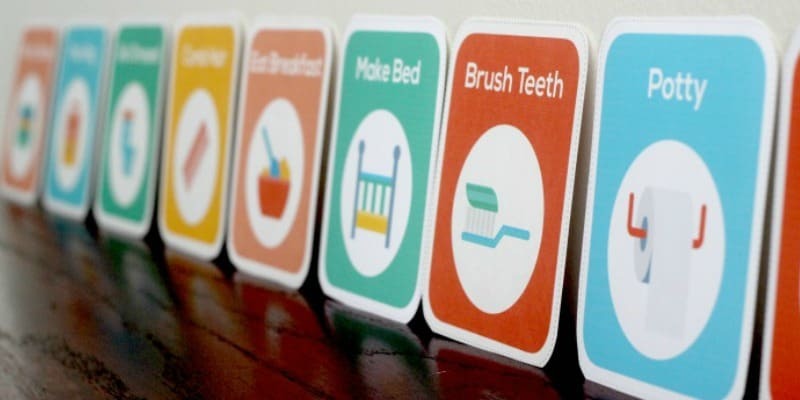 You can hang the routine cards as well and pretty soon you won’t need to reference anything, it’ll be second nature. While you don’t need to live and die by the clock, setting your phone, watch, or a timer will help you keep aware of routine transitions. We can often get so wrapped up in what we’re doing we forget we’ve let the baby sleep 4 hours. Why is that bad? Because 4 hours is a stretch littles ones should only sleep at night! I set alarms on my phone that show on my watch and this works for us. As with anything, if you want something to work then work it. Keep pushing what you’ve decided to do. If it doesn’t work then change it up a bit and keep going. Move forward. Want Printables to hang up? 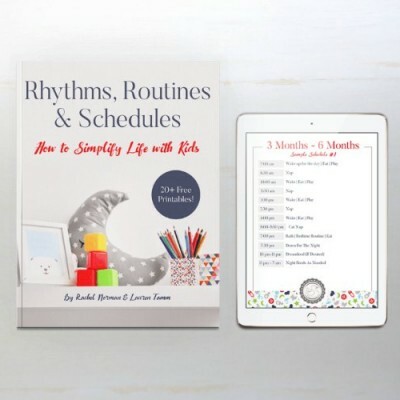 If you want routines and schedules for not only the 6 to 9 month age, but for the 12 month, 18 month, and on I’ve got great news. I’ve created a book chock full of routines that work. Routines that keep babies well rested, happy, and content. Routines that account for all the things you need to do and they are mom tested. The best part? The book comes with printable routines (3 choices for each age) that you can hang up and use! So instead of having to reinvent the wheel every few months, you’ll have tried and true mom tested routines right at your fingertips. Can you share how you put your six month down for a nap? Or how you do sleeping for infants in general? Like do you lay them down and leave the room and they just go to sleep? Thanks! Hi Jess! Yes, basically I rock them, sing to them, hug them, put them in the crib with their paci and then leave the room. by now he just goes to sleep on his own but if he really fusses I’ll go back in to give him the paci or cuddle him again! Thanks! I have a two month old and was wondering when you start doing that? Jess, I do it from birth really. I sing, rock until drowsy, snuggle, then put them straight into the crib. And I was just thinking that they very rarely cry or fuss about it at all if they aren’t overtired. Thank you! It’s helpful hearing about how other moms do it who are real and not theories in parenting books. Hi! Thanks for sharing your routine for a 6 month old. My son is almost 6 months, and I’m wondering if he’s getting enough sleep. Your schedule suggests them getting 5.5 hours of sleep during the day and then 12 hours at night. My son won’t sleep even close to that much. He takes 3 naps at about an hour each and sleeps from around 8 until 5:30 or 6. 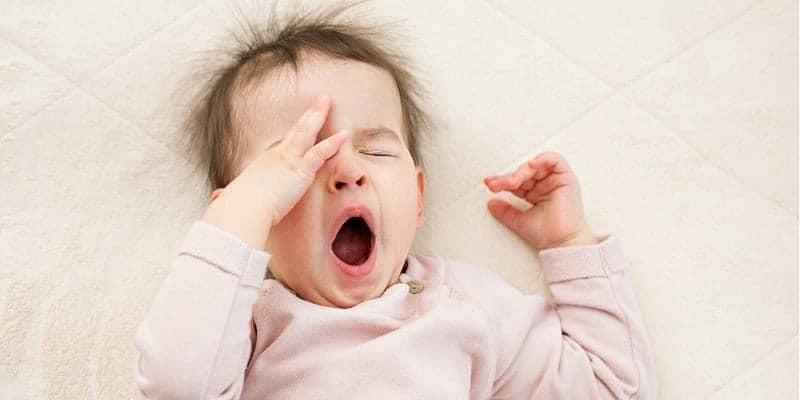 Do your babies really sleep that much? How could I get my son to sleep more, especially at night? I’m not complaining about the 8-5:30 because sleeping through the night was a struggle to begin with, but the 5:30 wake time and short naps during the day make it a very long day for him! Hi! 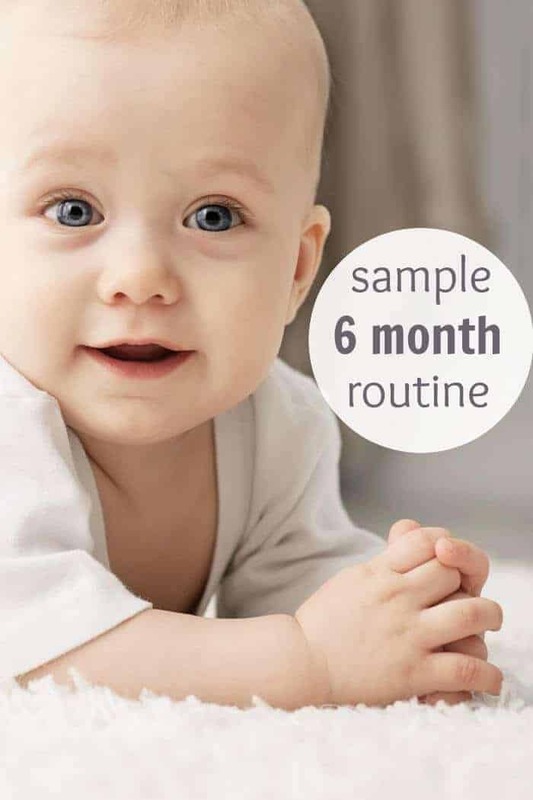 Your 6 mo routine suggests them getting 5.5 hrs of sleep during the day and 12 at night. I can’t get my son to sleep anywhere near that much! Is that just a difference in personalities or is it something I’m not doing? Right now, he takes 3 one hour naps during the day and sleeps from 8-5:30. I’d love especially to see him sleeping more at night. I can’t complain about the 5:30 wake time bc goodness knows it was a struggle to get him sleeping that much, but it does make for a very long day for both of us! He’s usually pretty cranky right before the nap times and before bed. What can I do? All 4 of mine have slept that much so I wouldn’t say personality but each baby is definitely different. Have you tried doing two naps instead of 3 and seeing if they stretch? Also, try putting him to bed a tad earlier, 7:45? and see if he sleeps later! Haha. Sorry I posted twice. I didn’t think it went through. ? I used white noise in the car with my aux and YouTube to make a fan noise and covered his car seat to make it dark just like it is in his room for nap time. Hi Rachel, very excited to have found your site! I like you am a big fan of routine, but have struggled to come up with a good routine for our 6 month old (first baby). 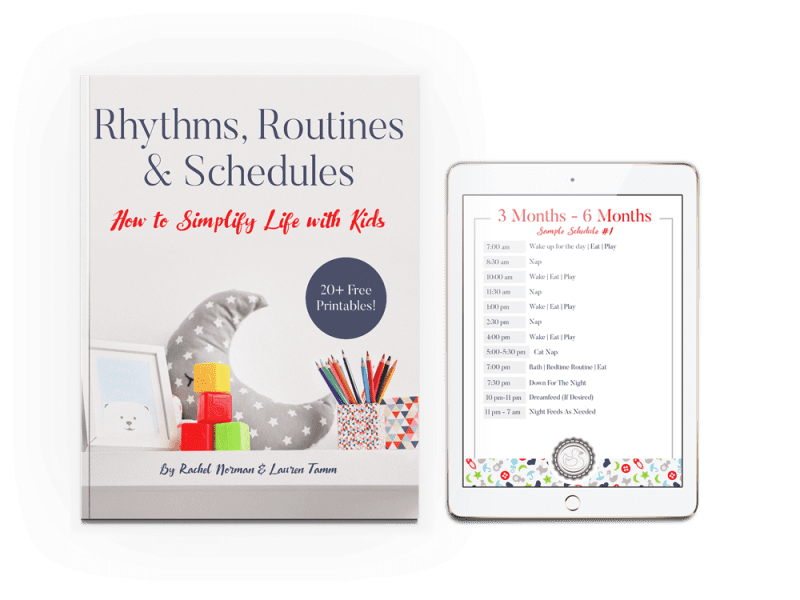 I just purchased your eBook with printable’s and was hoping it would include a six month schedule similar to the one shown here. None of the printable’s for a 6 month baby are the same as the schedule you have on this page. Is that right, or am I missing something? Greatly appreciate your help and feedback. Ack, sorry girl. I wrote that book with antoher friend and we both put good schedueles that would work, but I didn’t copy it exatly from this post. Can you use the blank page? I apologize, I said there were not similar schedules included in the printables. There are similar printables, and they seem great! I was wondering if there was a printable of the exact schedule you include on this page? Thank you again! Kristi, I don’t think there is. OH NO. Can you put it on the black printable page? I’m just wondering if you pump at night because baby doesn’t eat from 730pm until 730am? My baby will be 6 months next week and I plan to start introducing solids and hope to have his night feeds stop. Right now he goes to bed at 630pm, wakes at 9pm to feed and then sleeps until 4am-ish. I feed him again and he sleeps until 630-7am each day which works best with out schedules as I work 3 days a week. I want to continue to breastfeed by am worried when he starts sleeping longer about my supply. Andrea, I’ve never really worried about my supply but just kept on as normal. That said, right now my baby is not feeding at night much (occasionally I do cause I don’t care he’s the baby) and my supply isn’t as much as it used to be. I don’t pump because I’ve had 3 THREE pumps that all burned out and I don’t fancy spending $100 on a pump that breaks in 3 weeks. But I think if you can it’s a good idea. What if baby wakes at 815 would the next nap be at 945? Can I still keep the schedule just do it a little later ? Hi – I’m just searching the internet for sample 6 month old schedules to try to get my third baby on a better routine, and I’m reading through these comments. Diane – I’m no expert (hence searching for sample schedules, ha! ), but I do have three children and eventually have had all my babies on nice routines and well rested. Rachel’s children sleep A LOT. If you read some baby sleep books and/or websites you’ll see 14-15 hours in a 24 hour period is widely cited as the average amount of sleep. It also is normal for 6 month old babies to still take short naps (although frustrating). They will consolidate. By 9 months you’ll probably see 2 nice longer naps. At 6 months, still having three or even four naps is common since not all babies will do that nice 1.5-2 hours. Good luck! Agree with Brooke, as long as they are well rested and not clearly fussy or exhausted you’re doing fine! Hi Rachel my baby is 6.5months, want to know whether feed n solid to give together? I normally feed then follow with solids! First, I’m so glad I found your site! I have a 5 month old and have been struggling with the lack of predictability during the day. Your sample schedule is the first I found that actually looked realistic and after trying for just a couple weeks I can already see a difference. I was just wondering what you do if the schedule gets thrown off for some reason. Do you stick with the times and just move on to the next part, or do you adjust the timing of the rest of the day? For example my son slept for 2 hours durning his 8:30 am nap and then was of course not ready to take another nap at 11:30. Should I have woken him up sooner, or should I skip the 11:30 nap? Or sometimes he fights the 5:30 nap so we skip it. In that case would you move bedtime up by half an hour? Just wondering your thoughts on adjusting when part of the routtine gets interrupted. Taylor, so sorry this is a bit delayed but if I get thrown off I try to stick with the rest of the times that are there. So if the morning feed gets off I try my best to get back on the schedule at the normal times for the rest of the day. It doesn’t always happen but it’s easier when I can. First, I’m so glad I found your site! I have a 5 month old and have been struggling with the lack of predictability during the day. Your sample schedule is the first I found that actually looked realistic and after trying for just a couple weeks I can already see a difference. I was just wondering what you do if the schedule gets thrown off for some reason. Do you stick with the times and just move on to the next part, or do you adjust the timing of the rest of the day? For example my son slept for 2 hours durning his 8:30 am nap and then was of course not ready to take another nap at 11:30. Should I have woken him up sooner, or should I skip the 11:30 nap? Or sometimes he fights the 5:30 nap so we skip it. In that case would you move bedtime up by half an hour? Just wondering your thoughts on adjusting when part of the routine gets interrupted. Can you keep this schedule just use it at different times ? My baby wakes up at 815 goes to bed at 915. I can’t seem to get her to go earlier even if I start bedtime routine at 7. Also her naps are all over the place she only naps for 30-45 min. Yours so for 2 hours what do I do witih the extra hour and 15 min she takes 3 mini naps a day that’s it. She’s up much longer than your babies. absolutely, you can shift it up or back! The key is they aren’t awake too long in between naps, but it could start at 5 am if you needed. My 8 month old son usually wakes up around 6:00 am, but I would really like him to start his day at 7:00/7:30 so I have more time in the morning to do a few things before he gets up. Typically I nurse him when he wakes and then put him back in his crib; some days he falls back asleep and other times he doesn’t and I eventually go get him. If he doesn’t go back to sleep our daily schedule is off. Do you have any suggestions on how I can get him to a little sleep longer? 7:00-7:30 pm Nurse, bedtime (his bedtime has been at 7:00 and we are trying to move it to 7:30/8:00 so he wakes up later, but it’s hard if he doesn’t have his afternoon catnap). Helpful schedules! My 6.5 month old is taking three naps a day with apx 1.5- 2 hours between each. Each nap on average is only about one hour. I give him solids about twice a day. He is still waking a couple times at night. It’s hardto tell if he is truly hungry or if it’s just to soothe; I think probably the later. I often feed when he wakes and sometimes again before his nap and usually also nurse before bedtime. I notice you have this in your schedule as well. He always goes down drowsy but not asleep however I wonder if nursing so close to sleep time is still creating a strong association between food and sleep? I’ve often read that for bedtime especially you should nurse then do something in between i.e. read a book, and then put them to bed. What are your thoughts? Thank you! Hi, my son is 6.5 months old and we are still trying to establish a routine. He is going to bed around 6:30-6:45ish and is waking up every morning around 4:15. I’ve tried an earlier bedtime at about 6 as well as later like 7ish but still wakes up at the same time. We are not feeding him until about 5, we just let him cry it out until then. His naps during the day are only 30-45 minutes and he wakes up screaming. I know he is still tired so I let him stay in his crib 30-60 minutes but he cries and just won’t go back to sleep. Any suggestions would be much appreciated! Tif is he eating solids? If not then add a lot of food and that’ll help. You can also feed him at 4am without a fuss so that h’ell sleep later. Yes we are eating solids 2-3 times a day. The nights have been a little better the last few nights but still struggling with these 30 minute naps. I’ve tried keeping his awake time longer (2.5-3 hours) as well as shorter and it just doesn’t change anything. As soon as he wakes from a sleep cycle he’s up, even if I go in immediately and try to get him back to sleep he’s wide awake. I’m having to do 3-4 short naps a day just to get through our day as he will get very fussy. Any tips? Thanks!! Hi Tif – not sure when your comment was originally posted, but I’m having the exact same problem! 30 minute naps, only sleeping for 9-10 hours at night with 1-2 wake ups in between. Did you ever find anything that worked? I am having a hard time getting my 7 month old down without nursing. I made the mistake of nursing her to sleep and now the transition to her crib is so hard, sometimes we cave and let her nurse and lay with me while my guy stays awake and watches over us. This leaves him exhausted, me exhausted because I never get to go into deep sleep with constantly worrying about the baby next to me and our lo not knowing her crib is where to sleep. During the day she naps in her crib, and it’s really been more so the last month she’s reverted to this need to feed and be with me at night. We’ve tried different things but nothing isn’t working and I feel like I’m failing at something I always want to do my best with. I want a healthier setup for us all… all tips are welcome and I can use the help. Christine, can you just put her in there and then stand beside the crib to comfort her until she falls asleep? And do this over and over until she learns to calmly get to sleep there? On the 6-9 month schedule, you say “wake up, feed, solids.” Does that mean nurse and then also add solids? Or just feed the baby solids? Jamie! My boy is exactly the same! I thought you were writing about my guy for a second! He slept 5 hours at night ONCE since he was born. I feel you! I don’t understand the magic of how to get a baby on a schedule because I always see that they say naps are 1 hr or more! My guy doesn’t sleep more than 45 minutes! I’m like… how am I supposed to handle that? I’m going to try to adhere to this schedule as best I can since my guy wakes around 6:30 to 7 anyways, its just the naps that are a battle! I give up on sleeping through the night honestly! Just want solid naps! He’s always groggy and tired and has trouble focusing on tasks because he’s always tired! Thank you for this blog! Very useful!! I’m a first time mom and my little miracle will have tomorrow 6months. Until 4 months she slept 5-6-7hours during night time. I guess that was also because a was swaddling her. From 4 months I don’t swaddle her anymore because I am afraid she will turn on tummy and cannot turn again on back anymore. Also from 4 months she got teething pain. Now we have 4 teeth and seems a pause for now, but she cannot sleep anymore during night. We have a routine from first day home, but the last 2 months it doesn’t help. She has 3 naps during the day for 30min to 1 hour. We start bed routine at 7.30-8pm but she sleeps one hours at a time till 2-3am and after that she can sleep 4-6hours without wailing up. I don’t understand why is that and how to help her sleep better also in the first part of the night. Do you have ideas? Thanks again! I will be grateful if u help me out. How to handle things when living with inlaws, preparing for office lunch box and all that cleaning..and above all in laws taunting. I forgot to maintion that I am stay at home mom. And needs to prepare my husbands office lunch..then for me, my 2 yr old and in laws. And now for my 7 month old. Which follows with daily washing clothes, cleaning mopping and all. And then evening snack and dinner. With my first i took every effort and maintained her routine almost same as yours. But now a days everything is chaotic and it always take 11 pm for my babies bed time and then i have to stretch for another 2 to 3 hrs to complete remaining work. My baby will be 6 months this week. She has been sleeping from 6/630-5/530. Her first nap is usually at around 730-8 and will almost always be 30 mins. The following nap is about two hours later and will be her longest nap of the days, about 1-.5/2hrs. Then, the third will be a catnap that I will wake her from since she tries to sleep longer. It seems she progressively gets more tired throughout the day and WTs are getting shorter. Im not sure how to get her on a solid nap schedule and would also love for her WT to be at least 6/630am. Any suggestions please? Thank you! Also, she was waking at 430am before and now it’s been 5/530 am for a few weeks, even with early or later bedtime. Hi, I’ve found your schedules to be very helpful with my little one. I noticed that in the 6-9 month schedule you give your baby and snack and a quick feed before bed. How much milk do you typically feed him at that time? You mentioned that if my baby is waking frequently at night after 6 months that I need to check the amount of solids my baby is eating. I have tried to get my now 7 month old to eat solid foods since 6 months, but she just doesn’t seem to like it. I don’t want to force her to eat because I want meal times to be an enjoyable time. Recently my baby has been waking up anywhere between every hour to every 3 hours after putting her to bed at 7pm. Any tips on how to help my baby to eat solids would be greatly appreciated. I just came across your site. I have a 7 month old, & no real routine. My husband & I both work full time, so that in itself is a routine, but then evenings & weekends are all over the place, dictated by baby’s behavior. But it’s chaotic & driving me crazy. I feel like a bedtime routine would help but don’t know how to implement it. I try things but she doesn’t really respond to it, & I’m not sure if I should keep going with it or find something else that may work better. I used to be able to rock & nurse her to nearly asleep & then lay her down in her crib. Hower she’s on the verge of crawling j I feel since then, everything’s out the window, she wakes as soon as I lay her down & she’s up for hours, but tired & cranky. I’m slowly loosing it (not to mention house & everything else is totally neglected when dealing with a cranky baby). Any advice for working mom’s? Hi Rachel, I’m the new mommy of a 5 month old. She’s always been a great night sleeper, but just in the last week or so she’s started waking up at 3am. While she’s a great night sleeper, she’s never been a good napper, taking 3-4 naps a day, 30-45 minutes each. We’ve started solids twice a day and she is doing well with those, but I’m wondering what your suggestions would be to lengthen her naptimes and stop the 3am waking? Hi! I have a routine but my problem is that my baby doesn’t wake up at the same time every day. It’s between 6am-7am, I’ve tried to settle him back to reach 7am but he won’t. How do you manage to make a baby sleep on the time slots they should? I love your website, it was a lifesaver when I had a newborn. My son is now 6 months and goes to sleep like a dream in the evenings. But at nap times it is almost impossible. He cries and cries unless we rock him (something we never do in the evenings). How can I get him to go to sleep more easily for his naps? Also, his naps are still very short, they always have been. 3 naps of maximum 40 minutes each. Should I be trying to get him to nap longer? I noticed on all of your schedules the first nap is usually 1 or 1.5 hours after wake up time. Why is it so soon after waking up? I also hear it’s the “easiest nap.” I try putting my little one to sleep but I noticed it’s often the hardest nap for him to take. Usually by the time he goes to seep it’s 2 hours later. Any recommendations on this? So, I counted the total sleep in your schedule. It’s 17.5 hours. 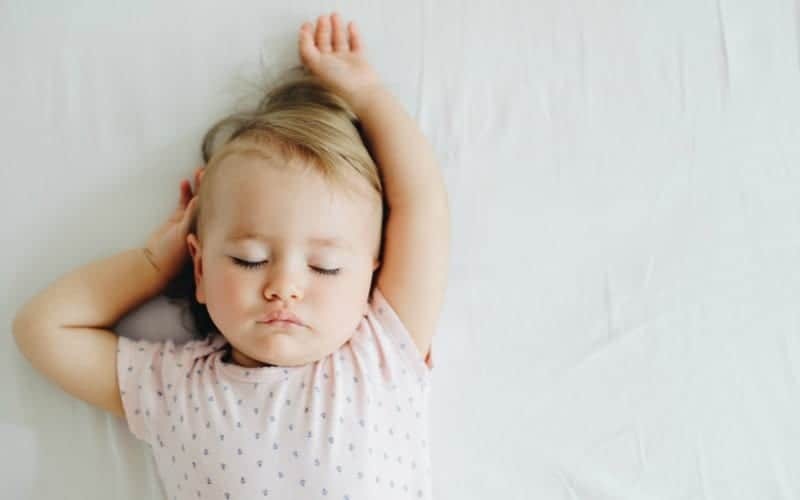 Does your six month old really sleep that much? Our dr told us normal is 14.5. If your baby sleeps 17.5 you are really lucky. There is no way I could get my baby to sleep that much. You are lucky. There is no way I could make this schedule work for us, sadly. Some did, some definitely did not! If your baby is not overtired then YOU ARE DOING FINE! I’m so glad I stopped by here and saw your recommendation :) it took us two nights to sleep train our son! Thanks so much!! I’ve heard about this book before and was not so sure about this. But when I tried – I changed my mind! It’s totally cool that just few pages of information are changing your life this much this fast. Susan is the best!